Native Americans called it “Trickster.” The coyote has a knack for adapting and surviving almost anywhere. People have been persecuting the coyote for more than a hundred years — but it just won’t die out. In the past 50 years, some four million coyotes have been either poisoned, trapped, snared or shot. 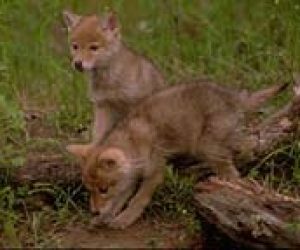 And not just by ranchers and hunters — a taxpayer-financed government agency — called Wildlife Services — killed 86 thousand coyotes in 1999 alone. But still the coyote is thriving. A century ago, coyotes were found only in the western US. Now they l’ve in every state except Hawaii. They’ve even been sighted dodging taxicabs in the Bronx. Marc Bekoff at the University of Colorado, Boulder, has been studying coyotes for more than a quarter century. He told us how the coyote is able to survive the kind of persecution that pushed the bison, wolf, and passenger pigeon toward extinction. Marc Bekoff: Coyotes are amazingly adaptable animals. They can live in all sorts of habitats ranging from desert to high mountains . . . They can live in cold and warmth . . . they can live on mice, they can live on ground squirrels, they can live on lizards, they eat fruits. They’ll eat inanimate objects — they’ve been known to eat boots and belts and clothing. So coyotes are successfully adapting to our human-dominated world. And Dr. Bekoff says we can learn a lot about flexibility and versatility from coyotes by letting them be. There’s even evidence that in areas where coyotes are killed, birth rates and litter size increase, the result of which is the maintenance or increase in coyote numbers. I think, if you will, the coolest thing about coyotes it that they are such adaptable beasts and that we can learn a lot about flexibility and versatility by basically letting them be.